In gathering this information for the history of our parish we have had to rely on bits of information secured from various sources, personal memories and items taken from publications. This is not a formal historical account, nor in any way exact and complete. The first beginnings of Catholicism in Tillamook County and Rockaway started in the 1860's, when Father Adrian Croquet from Grande Ronde would come to Tillamook to offer Mass once or twice a year in the home of some Catholic family. The homes of Dr. Davidson, who lived at the mouth of the Wilson River, Mrs. Cecilia Bayley of Garibaldi, and William Fitzpatrick were used. We can imagine that the Catholics of Rockaway area attended these Masses as weather and means of transportation allowed, coming on foot, horse back, by wagon and even by boat. When Sacred Heart church was built in 1891 and St. Alphonsus Academy in 1897 we feel sure that they made use of these facilities. We can find no record of Mass being said in the Rockaway area until July 10, 1921. From the Catholic Sentinel of July 28, 1921, we learn that a theater was used. From the Catholic Sentinel of November 3, 1921 we learned that Archbishop Christie blessed a Catholic church at Wheeler on October 30, 1921. Earl Cronen, a resident of Wheeler at that time said the building had been a Methodist church and had been purchased by the Catholics. It stood a short distance from Mr. Cronen's home. In this building there were living quarters, in which a Mr. and Mrs. Bradley (non-Catholics) lived and acted as caretakers. Prior to the availability of the church building, Mass was often said in the Cronen home and various homes in communities of other areas. Earl Cronen remembers a dresser being used for the altar, covered by the best dresser scarf, the candles in brass candlesticks brought by his mother from Scotland. Priests that he recalls were Fr. Anselm Sherlock, the first Benedictine priest to come to Tillamook County, Fr. Hildebrand Melchior, Fr. Raphael Bluemmel and Fr. Michael Reilly. Mr. Cronen attended St. Mary's by the Sea at Rockaway after it was built and was not sure how many of these Priests had come to Wheeler. From notes received from Ed O'Meara of Portland (of the Oregon Journal editorial department) : "My earliest recollections would go back to the early 1920's. The first Mass I recall attending in Rockaway was offered in the front room of the home of Mr. and Mrs. Ed Walsh which was a vacation beach cottage somewhat larger than most. It was located just east of what is now the main highway through Rockaway. Father Hildebrand set up a small altar on Mrs. Walsh's sewing machine at one end of the room. There must have been thirty or more people there, including my mother, grandmother and two younger sisters. This likely was in 1922 or 1923. By the time I knew how to serve Mass, Father Hildebrand was using the Rockaway motion picture house which was on the west, or ocean side of the same street as the Rockaway Dance Hall. It was a sizable all wood building of unpainted boards with tar paper roof and cracks showing between the boards. Father Hildebrand set up an altar on the stage of the theater. I served quite a few Sunday Masses here, clumping back and forth on the rough, wooden boards." Mr. O'Meara also recalls that later on Masses were said in the large living room of the rectory. Leo Sander of Tillamook tells of making the trip north on Saturday a number of times in those early days with Fr. Hildebrand. They would drive to Nehalem and out to the farms to let people know there would be Mass in Wheeler on Sunday morning. Evelyn Damon, long time parishioner of St. Mary's lived near Jetty Fishery at that time and remembers Fr. Hildebrand taking her and her family to Mass at the Cronen home. On July 10, 1921 Mass was celebrated for the first time at Rockaway, one of Tillamook County's most popular beaches. Fr. Hildebrand Melchior arranged for Mass here as often as possible during the summer months. A theater (or moving picture house), described by the Catholic Sentinel as a "shack" was used. From 1921 through 1927 Mass continued to be said in the theater in Rockaway every Sunday at least during the summer months. The size of the congregations indicated the urgent need for a church. On August 16, 1923 the lot where the parish house and hall now stand was purchased from Emma D. and W. C. Hawk for $300.00. The balance of the corner lot, bordering on 3rd and Pacific were secured in 1927 by Fr. Hildebrand from William and Mina Van Hoomissen. A residence which was used as the parish house stood on this property. This parish house was always known as Villa St. Benedict. It should be noted that the Benedictine Fathers from Mt. Angel Abbey took over the parish of Sacred Heart in Tillamook in 1917. It was their missionaries who came to Wheeler, Rockaway, Garibaldi and Bay City. In 1926 plans were being made for a church to be built at Rockaway. Michael Melchior, Fr. Hildebrand's father, an architect and carpenter who was the key figure in the building of St. Joseph's Church in Cloverdale in 1921-1922, was named, with Fr. Hildebrand, to design and build the church. The building was to be 33' x 60' with sanctuary and sacristy in addition. The Extension Society of Chicago donated $1,900.16 toward materials and furnishing. Archbishop Edward D. Howard was persuaded to contribute $500.00 which he had been given to use as he saw fit. Many hours must have been spent in designing the church. The setting, so close to the mighty Pacific Ocean called for something special, and it is certain that all who have ever worshipped there, parishioners and visitors who come in the hundreds, would agree that St. Mary's by The Sea is very, very Special. The words used most often to describe it are "unique" and picturesque." Two small stained glass windows behind the altar, one of Twin Rocks, the other a lighthouse beacon shining on an anchor, set the nautical theme, and it is used throughout. Fr. Hildebrand and his father but we have record of only two names: Mr. Neal Abrahamson, Sr. and Edward Best. Mr. Abrahamson shingled the roof, and Edward Best helped with the painting of decorative designs on the beams of the church. The church, a handsome, well constructed building located about one hundred feet south of Villa St. Benedict, was completed and ready for services on June 21, 1928. In an article contained in the Catholic Sentinel, July 9, 1965 we find an excellent description of the church by Bartlett Jones: "When Fr. Hildebrand Melchior, O.S.B. then pastor of the Tillamook Parish which had Rockaway as a mission, built the church of St. Mary's By-The-Sea in 1927 be was no doubt highly influenced by the nautical atmosphere of its setting. While the sea motif is not evident from the outside, to walk in, is to enter the world of sailing ships. The walls and ceiling of the church are paneled in the manner of ship's cabins, using hand-selected, straight grain, knot free cedar boards. The beams in the ceiling, and particularly around the sanctuary, reflect the influence of the shipwright rather than a carpenter. The lighting is supported on four-pronged anchors decorated with a ship's wheel and hung from the center beam with chains. In the sanctuary are two ships' lanterns, one on either side of the altar. On the side altars, half-anchors support the lights. Two stained glass windows adorn the wall behind the alter. Two years after the church was built (1929) the Church was fitted with a new bronze Bell with the inscription "In Honor of The Blessed Virgin Mary, Rockaway Oregon, August 11, 1929". Two large paintings, recently added, add color to the interior. One, on the lower part of the altar, is of Christ in the fishing boat with the Apostles, and the other, a seascape painting of the Virgin Mary dominates the rear wall of the church. The holy water fonts are carved in the shape of Spanish galleons. A white painted concrete statue of the Holy Mother was set in front of the church, facing the sea. From the area in front of the church facing the ocean the two large monoliths of Twin Rocks are visible, including the large hole which the sea has punched through the south rock." Father Victor Rassier was the first pastor after Rockaway Mission was established as a parish on March 17. 1948. 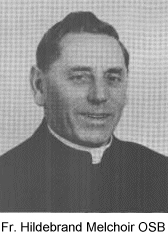 Father Victor came in September of 1947, and remained until August 19, 1961. From an article in the, Catholic Sentinel dated January 13, 1949, some facts reported from St. Mary's By-The-Sea are interesting because they indicate the large number of parishioners at that time. Up until the end of 1948 Father Victor had performed twelve marriages and thirty four baptisms. There were thirty nine in attendance at religious summer school, eleven of whom received first Holy Communion. There were seventy five children at the Christmas party. classes began, he did most of the teaching of grade school classes himself, picking the children up and teaching them in his car. The Ladies of St. Mary's Altar Society was organized in 1948, with a membership of between thirty and thirty five. These ladies have undertaken many projects over the years, and carried them through successfully. Money making has always been necessary in order to carry out their plans. Rummage sales, two a year, have proved good money makers. The Ladies have purchased dishes and tableware, tables and chairs for the hall, have been responsible for the electric bills for years, have donated to various charities and so on. They also manage the care and regular cleaning of church and hall. Since April of 1978, the Society is affiliated with the Archdiocesan Council of Catholic Women, Astoria Council. It must be mentioned that the C.C.D. program has been conducted continuously during the school years, from 1948 to the present, with the teaching being done by the pastor and a few other dedicated persons. The parish owes these teachers a great debt of gratitude. When there were only two Sunday Masses, the ever increasing numbers of summer people and vacationers helped to fill the church to overflowing, especially on holiday weekends. Folding chairs were placed on each side of the center aisle, and people stood along the side aisles, and outside. Some consideration was given to building on to the church at this time. In the early 1970's, changes in church regulations allowed the saying of Vigil Masses. One Mass at 5:30 p.m., and eventually an other one at 7:30 p.m., relieved the crowding conditions satisfactorily. St. Mary's By-The-Sea, was established as a parish on March 17, 1948. Pastors who served at St Mary's by the Sea since 1948.